The same advances in electronics that bring us ever more powerful smartphones are helping NASA become more nimble in exploring the universe. Engineers are taking advantage of the low-cost, highly integrated components developed for phones and using them to build satellites that are small enough to hold in your hand. They're easier to build and cheaper to launch than conventional satellites, and provide a testing ground for other technologies used in space. The technology allows for "fast, affordable, transformative missions. We can try new things more quickly, take risks that we might not take with a much larger spacecraft, and we’re using it as platform to develop and test new technologies that might be useful for spacecraft of any size," said Andrew Petro, who heads the small satellites program at NASA Headquarters in Washington, D.C. He spoke recently at NASA's Ames Research Center in Silicon Valley, where some of the small satellite work was on show. Typical of the work being done here is Nodes, a pair of "cubesats" scheduled for launch from the International Space Station in early April. Each measures just 10 centimeters across and 17 centimeters long and weighs 2 kilograms. They're the epitome of low-cost engineering: they run the open source Android OS and use strips of a metal tape measure for their antennae -- a popular choice for cubesat builders because they they can be folded down for launch and then spring up by themselves when they need to be opened up. The Nodes satellites will orbit the Earth, relaying information back and forth between each other and to stations on the ground. Sometimes one will take the lead and coordinate communications, at other times the other will. It's a test of a more flexible networking system that will help NASA work out the best way for multiple spacecraft to talk to each other relay data back to Earth. Until now, that hasn't been much of a concern because most satellites operate independently, but with cubesat projects several can work in unison. 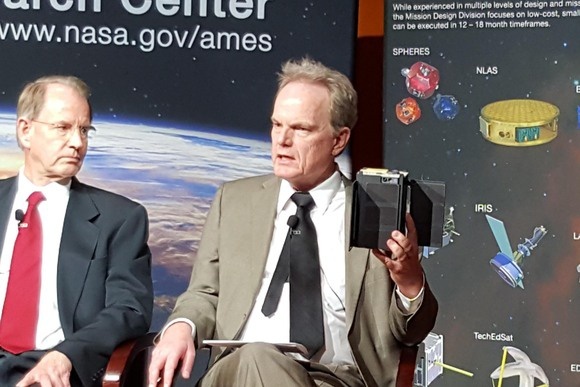 One such project, AeroCube 6, has involved two cubesats collecting radiation measurements in space, said Richard Welle, director of the microsatellite systems department at The Aerospace Corp. in El Segundo, California., which is working with NASA. Richard Welle, director of the microsatellite systems department at The Aerospace Corp holds a model of NASA's Nodes cubesat during a briefing at Ames Research Center in Silicon Valley on March 8, 2016. With a single spacecraft, it's impossible to know if an uptick in radiation is due to some event that happened at a particular time, or if the spacecraft traveled through an area of increased radiation. Two spacecraft can help sort that out, because each takes measurements at slightly different times and locations. A swarm of cubesats provides even greater accuracy. "There are kinds of data that you can’t collect with single spacecraft but you can with large [numbers of] spacecraft," Welle said. While AeroCube 6 uses two satellites, some projects plan greater numbers working in unison. The Nodes mission is integral to those efforts, helping to figure out the most efficient way for small groups of cubesats to talk to each other. Just because the satellites are small and low-cost doesn't mean the are any less ready for space. 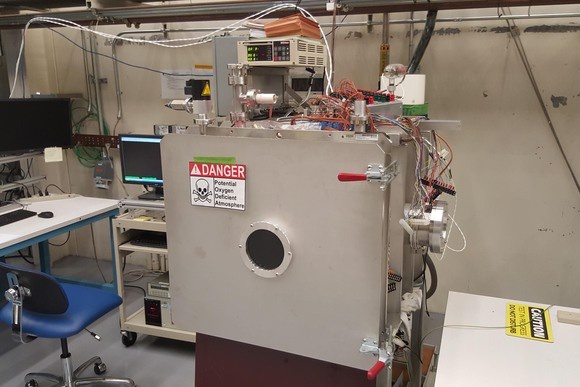 In a lab at the Ames Research Center, cubesats are put through their paces to ensure they're ready for the rigors of launch, deployment and a life in space. An atmospheric testing chamber for cubesats at NASA's Ames Research Center in Silicon Valley on March 8, 2016. "We like to say we 'shake and bake and sometimes break,'" said Lynn Hofland, who runs the lab. It has machines for testing vibration, shock, G-force, extreme cold and the ability to survive in a vacuum. NASA has a busy schedule of future cubesat missions, and other projects are planned and in operation by companies, universities and other organizations. As the innovations in electronics keep bringing new capabilities to handheld computers, Hofland's shake-and-bake lab will be busy for some time yet.